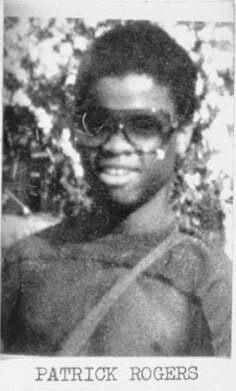 16 year old Patrick "Pat Man" Rogers (145lbs) lived in Thomasville Heights housing projects at 1095 Henry Thomas Drive SE, with mother Annie Grace Rogers, 43, and 3 brothers and 4 sisters, where Pat Man wrote music with friend Joe Harper. Patrick attended Grady High. A white boy from his school was friends with Wayne Williams. Patrick carried groceries at Moreland Avenue Shopping Center. He knew Aaron Wyche and Aaron Jackson and once bought Lee Gooch a beer at Underground ATL. "Pat Man" hung out at a fast food restaurant on Moreland near I-20. His mother claimed he knew Darron Glass, Lubie Geter and Curtis Walker. His uncle was Willie Paul Rice, 36. Rogers was last seen with 7 year old brother, Isaac, at a bus stop Henry Thomas Drive. Mary Harper reported that he was later at her apartment (1100 Henry Thomas Dr. SE? ), looking for her son Joe Harper, telling her that a man wanted to record his songs. One week before, a black man thought to be Wayne Williams was seen leaving flyers at this housing project. A burglary warrant was issued on him 2 days after being reported missing. On the same day his maternal grandmother died, the body of Patrick Rogers was found on the Cobb County side of the Chattahoochee near the Paces Ferry Road bridge, caught on rafter cables. The cause of death was a blunt force trauma to head. His murder was the 24th that the state cleared by Williams' arrest.